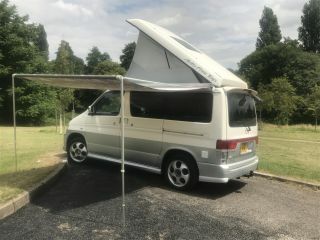 Betty the campervan has unique styling which turns heads wherever she goes. She is equipped with everything you need for a comfortable camping trip. The leisure battery enables you to go off grid and still have access to electricity; including a 38 litre fridge along with icebox, 3 LED lights, 12 volt charging socket to charge mobile devices from leisure battery. There are 2 three-pin sockets and 12 mtr connection cable for electric hook-up. Betty has a fully functional sink, water is replaced with a refillable bottle. Twin hob gas for cooking, plenty of storage for food, stowaway rail mounted table, fire extinguisher. There are also cups, plates, cutlery, frying pan etc, everything one needs for cooking and feeding up to 4 people. 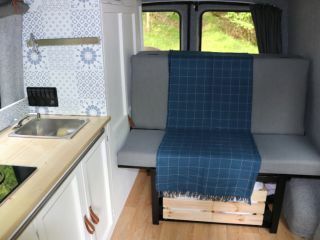 The interior has been tastefully decorated with bespoke curtains, cushions and re-upholstered chairs which also fold down into a small double. 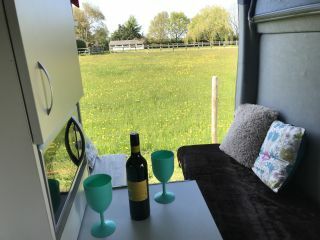 There is an electric elevating roof, by day this allows for head space and standing room within the van and by night turns into a double bed. Suitable to sleep 2 adults and 2 children. We supply an awning or pop-up tent for storage or extra living space, tea towels, washing up liquid and other cleaning supplies. Additional cleaning rate of £35 will apply for any pets taken. Your anytime anywhere 4 x 4 winter camper.